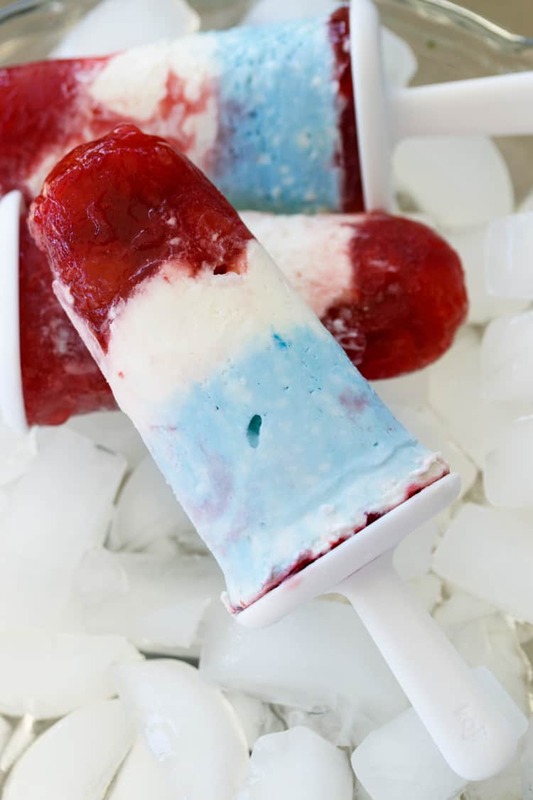 These patriotic cherry cheesecake popsicles are so decadent and creamy, easy to make, and perfect for the 4th of July! I’m just gonna go ahead and say it. I’m pretty much a genius for creating this recipe. 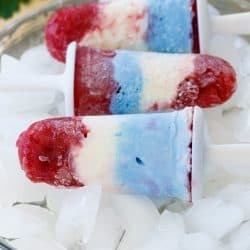 I actually made these last year for the first time, and felt very much compelled to bump them right back up to page one because you *need* to make these popsicles for the Fourth of July this year. I’ve giving you ample notice. Purchase some popsicle molds, and make ‘em. They’ll stay good for months in the freezer. This one is fun to make with kids too! What better activity is there than popsicle making!? Then when the fourth rolls around you can whip out these bad boys when people start to get hangry. (Hot + Angry)- See what I did there? By the way, canned blueberries can also be used instead of the canned cherries, or in addition to. Go crazy, red white and blue forever! Now here’s what I think. You should probably join my free recipe email list. You’ll get a weekly email with my brand new recipes. (And follow me on Facebook, Instagram, and Pinterest.) -Full on stalk me. I mean it. Set the blue food coloring and cherry filling aside. Combine all remaining ingredients in a large bowl with an electric mixer on medium speed until smooth. Take half of the cheesecake mixture and place it in a separate bowl along with 4-5 drops of blue food coloring. Stir until uniform in color. Spoon 4-6 cherries into the bottom of each popsicle mold. Evenly dispense all of the white cheesecake filling into each Popsicle mold. Using a pastry bag makes this a bit easier. You can use a napkin to clean up any unwanted filling from the sides but a swirl look is also pretty! Repeat the same step with the blue cheesecake filling. Fill any remaining space with additional cherry filling. 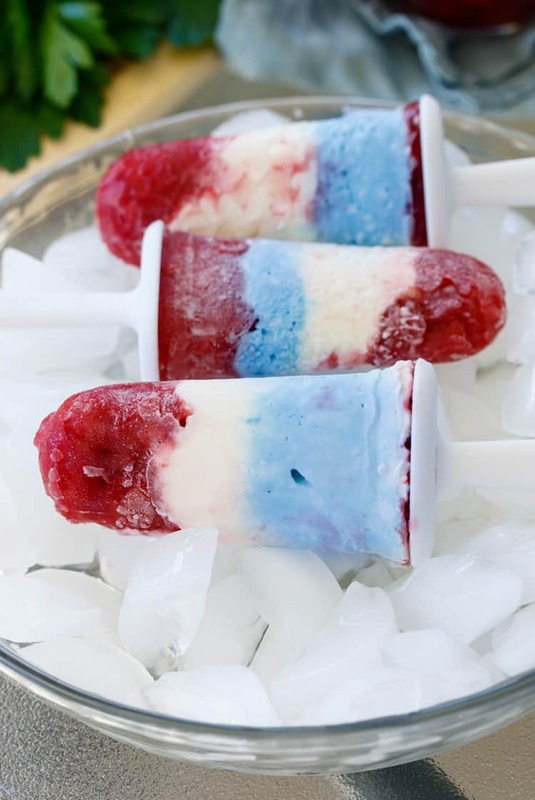 Freeze for at least 3 hours, or until you're ready to enjoy them! Using room temperature cream cheese ensures that the consistency is nice and smooth when mixed and prevents lumps! Great site. The creamy chicken stew is awesome. I live with myself so I kinda have to wait to try out larger recipes however it’s something I look forward to and I get psyched about preparing it, cooking it and waiting for reactions! It so cool. Thanks a million. Hey Joseph! What a great comment for me to read first thing in the morning, thank you! We are alike- trying out a new recipe is my idea of fun for sure as well! I love spending time in the kitchen creating something new, (and I love the creamy chicken stew recipe as well, definitely a favorite of mine!) Thanks so much again and have a great weekend!